Congrats on your project getting some well deserved Web attention. Thanks man! It's pretty exciting. Hey, where did you get that knurling machine from? I have been wanting to do something similar, and I have some aluminum stock laying around. It's a smithy milling/lathe machine,, it's expensive, but very well worth it. Just do a google search for Smithy Lathe,, I think that one is the Midas lathe/milling version. I already have the lathe, I just need to know how you do the knurling. Thanks a lot man! We'll have to have you up from Austin sometime. Sweet, if you're in dallas you're closer to my lathe than I am. It's on my family ranch southeast of Dallas about an hour. I actually live further east of Dallas in Rockwall County. Too bad I'm not up that way more often, you could use my knurling attachment and radii cutter. 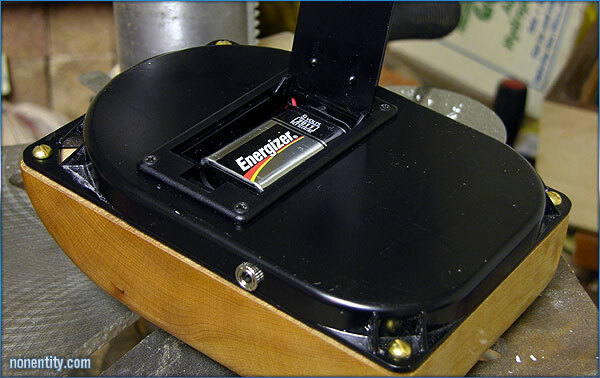 I just posted the shots of the harddrive case I used as the base of the amp, and the freshly installed battery door. Also a movie with sound of me playing on it, for those who want to judge the sound of the amp, if not my playing ability. And, there's a new project up, I think it will be another amp, but I haven't decided yet. But the 6x6x3 piece of big leaf maple I got for it is absolutely beautiful! Hah, there's not much there yet! I just got the wax peeled off the block yesterday. I've got to get some supplies from Radio Shack. The types of wood I get are sometimes coated in wax to keep out moisture. 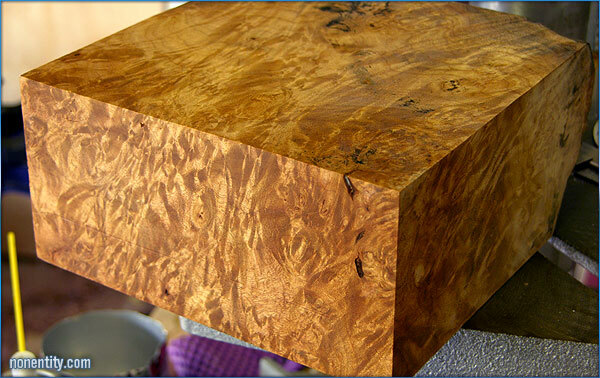 They're usually bowl turning blanks of some kind of hard to come by burl wood. When I go to the wood store, they always ask what I'm up to, since I never just turn a boring bowl out of the bowl stock they have. I usually try and do something different with it.